Core Values in our lives – God, The Word, Prayer, Holy Living and, now, Love. Love has to be the flame that burns within us, the source that feeds out spirits, minds, deeds and emotions. 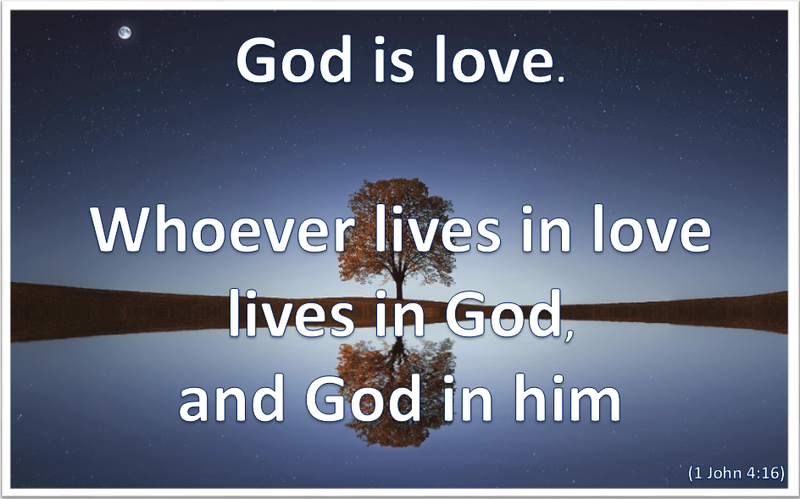 For God is Love – and if we are in His image then it should be love that characterises us as well. And so Scripture tells us that love is essential to us. This love is not a product of our own efforts but comes from God and through God. It is a consequence of the love that He has for us and which He has revealed to us. Five Core Values for which to pray and keep on praying – through the sunshine and the darkness – and which to allow the Holy Spirit to live out within us and through us as we trust and follow His guidance. Heavenly Father as the moon reflects the light and the glory of the sun, so may I shine with Your love and truth in the darkness of the world around me – and may You be honoured and glorified in it all. Amen.